First of all, I'm getting married in September....I'm a blushing bride! Yes I am. And....I just celebrated my Bridal Shower with a bunch of very special people over the weekend. Of course, my Mom put me in full charge of the desserts.....ha ha.....bad idea, Ma. Putting me in charge of desserts when there is no budget or limit is like creating a sugar-coated Frankenstein. But, it's too late. I became Frankensteina and totally tore up her kitchen. I put it back together though, I promise. So, I decided to make a full dessert bar including a miniature Wedding Cake as the centerpiece. In the end, I think there were about....15-20 items. It sounds like a lot, I know. But, they were all worth it. And, yes, I did try them all. And, yes, I did gain weight over the weekend. Worth it? Heck, ya. I've actually been testing several original recipes for the vanilla cake layers of my future Wedding Cake, and, being the obsessive perfectionist that I am, it took me about 8 trials. I find it much more challenging to make a great white or yellow butter cake than it is to make a chocolate butter cake. Maybe it's because there's no seductive chocolate flavour to steal the spotlight and hide the true mediocreness of the cake. Or, maybe it's because the unique melting profile of cocoa butter in chocolate adds extra moisture and a sublime texture to the final product that butter just can't compete with. Whatever it may be, I'm sure of it. 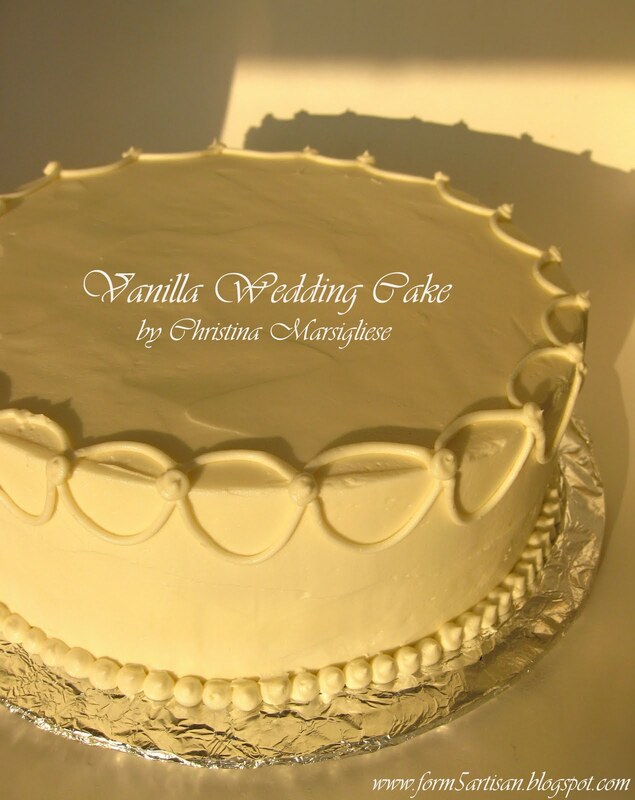 Something you need to know about Wedding Cake is that it is very demanding. The layers must be delicious, moist and tender, yet durable and stable with a firm crumb in order to handle all the flipping, flopping and heavy frosting. It's like an oxymoron, but it is important to find the right balance. 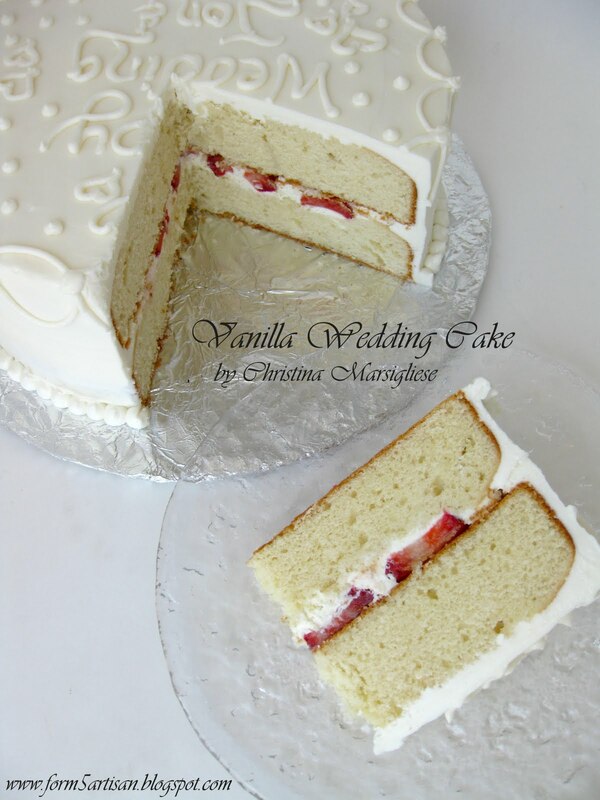 Here is my Vanilla Butter Cake with Strawberry Whipped Cream and Bourbon Vanilla Buttercream. It's simple, classic and....pretty, isn't it? There are sliced fresh strawberries in between the cake layers too. 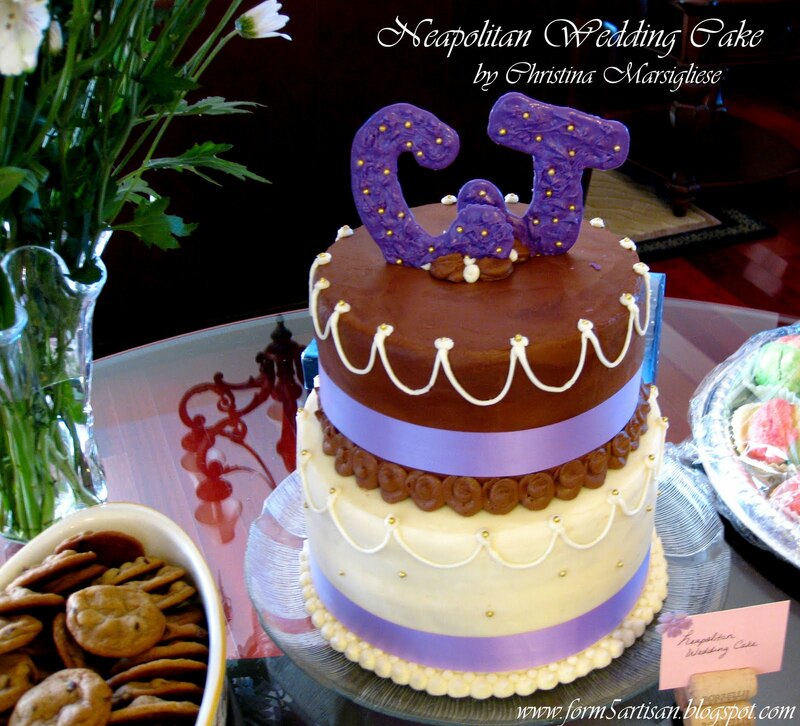 The classic combination of Vanilla, Chocolate and Strawberry allowed me to call this a Neapolitan Wedding Cake. I made giant initials from purple moulding chocolate as the cake topper (my Fiance's name is Jonathan. He's sweet). My wedding colours are purple and gold, if you haven't already figured that out. It's perfect! And, oh my gosh....it was really, really good. Congratulations! I'm new to this blog, it's lovely. Questions though- 1) is there a recipe for this cake? If so I cannot find it- there appears to be one for the chocolate section but not vanilla, and 2) How does one access your recipes? I saw that another reader had problems and you said to click on the "recipe" itself and it would open another page- nada, doesn't work for me. Thank you..! I didn't taste the cake! Oh, I'm so upset! 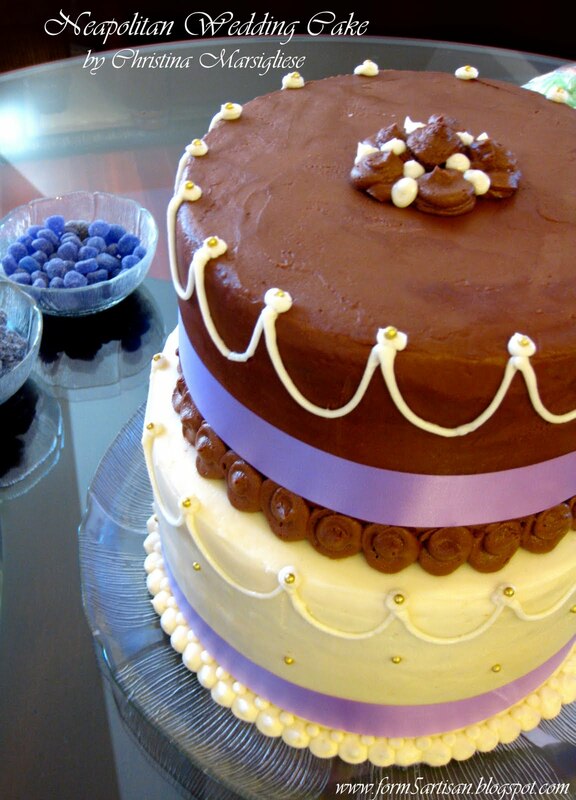 I can't wait for your wedding to taste the REAL one! Great seeing you in TO; thanks for a great weekend!